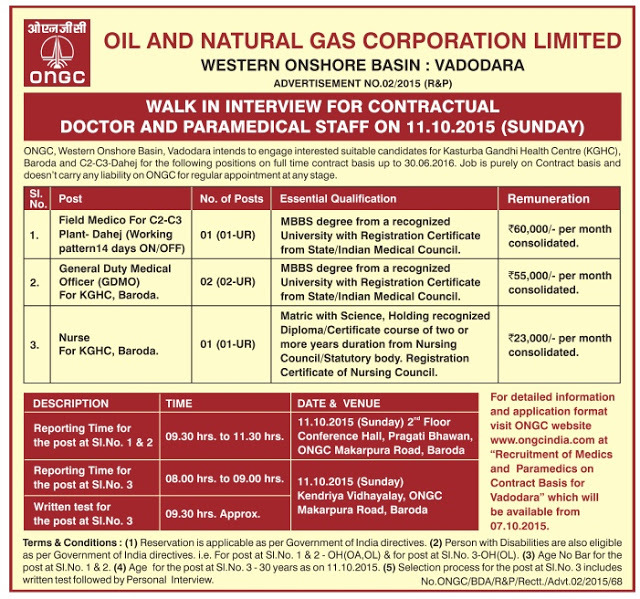 Oil and Natural Gas Limited (ONGC), Western Onshore Basin, Vadodara has published a Advertisement for below mentioned Posts 2015. Check below for more details. MBBS degree from a recognized University with Registration Certificate from State/Indian Medical Council. MBBS degree from a recognized University with Registration Certificate from State/ Indian Medical Council. Matric with Science, Holding recognized Diploma/ Certificate course of two or more years duration from Nursing Council/ Statutory body. Registration Certificate of Nursing Council. For FM & Medical Officer: 9:30 a.m. to 11:30 a.m.
For Nurse: 8:00 a.m. to 9:00 a.m. Date & Time of Written Test for Nurse: 11-10-2015 at 9:30 a.m.